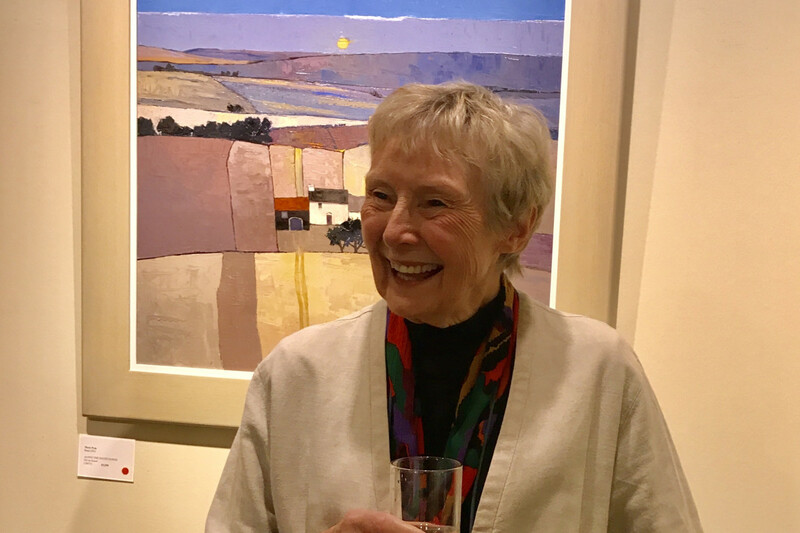 It was wonderful to welcome Mary Pym and her family, along with many of her admirers and collectors, to the gallery on Friday 6th October for the opening of her solo show. This is the largest collection of Mary's landscape paintings work ever to be exhibited in one gallery and it is a superb body of work. Equally impressive is that her work is so well loved that almost half of the paintings had sold before the show was even hung! It is not all over, however, and there are still some excellent examples of her work for sale - do check out the "Current Exhibition" on the website or pop in. Mary has worked incredibly long and hard to produce this collection. She told me it had taken over a year to paint and I was surprised that it had not taken a lot longer. If it was not for her dynamism and energy this show would never have been possible. Thank you! Each canvas and oil painting is a self-contained landscape that binds the natural world to man's marks upon it. Most of her paintings have a flat almost grid like structure that usually comes from the very British landscapes they depict. The slightly irregular blocking of fields takes on a cubist quality. At the same time they are flattened into a two dimensional plane, yet with the depiction of a horizon and perspective, there is simultaneously great depth. The colours like the lines are strong. They are the brilliance of corn, flax and sunset - entirely part of nature enhanced by a strong light. Natural yet vivid at the same time. Mary was born in Holland in 1935, but has lived most of her life in the UK, particularly in Hampshire but with time in Ireland, Scotland and Devon too. Having trained at the Winchester School of Art in the 50's and then at Southampton College of Art in the 70s where she also taught, her work feels very familiar to our Hampshire eyes. Intimate and yet with big horizons, hovering between abstract and figurative, it is easy to understand why these calming pictures are so loved by collectors of contemporary painting. They have both a very contemporary and yet timeless quality. Not around for long, do pop in to the gallery before the 13th October to enjoy them.